If you have a restaurant or an eatery you will definitely require able personnel to deal with the cleansing of dishes. You can find the right candidate from the market if you write a complete Dishwasher Job Description for the online recruitment portals. In these cases, you need to be specific about the work that he has to do. It is an easy method to get across to the available talent in the industry. 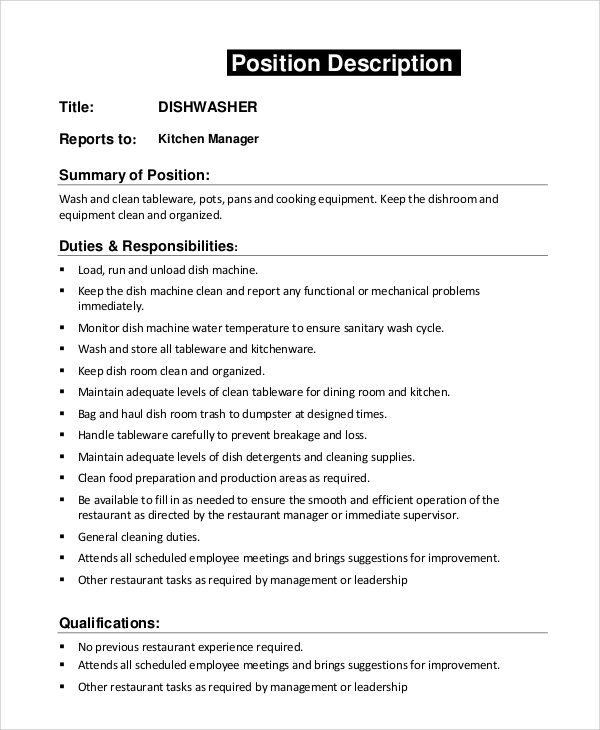 Here are some common Job Description Samples for dishwashers and you may follow any of the formats provided here. 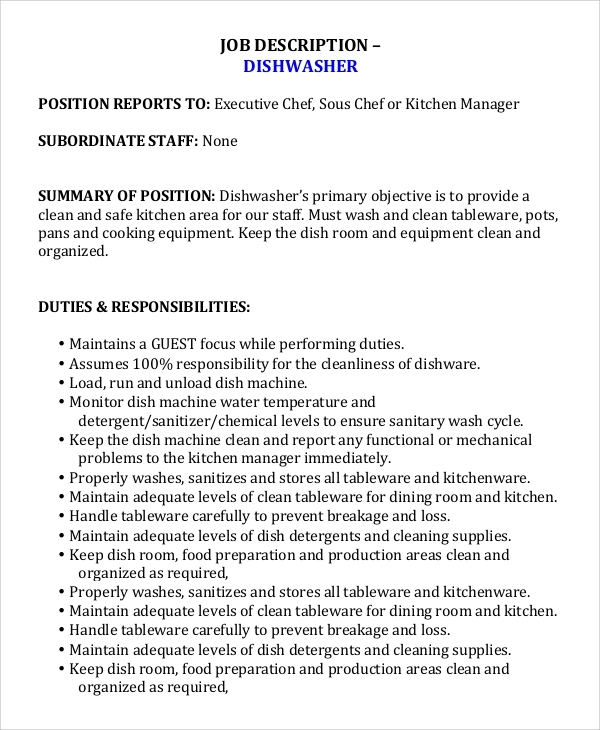 This is a typical dishwasher job description with all the duties and responsibilities listed up with bullet points. The qualifications are also included in the document. There is a separate section with the guidelines on cleanliness and sanitation. The name of the organisation is specified on the top. 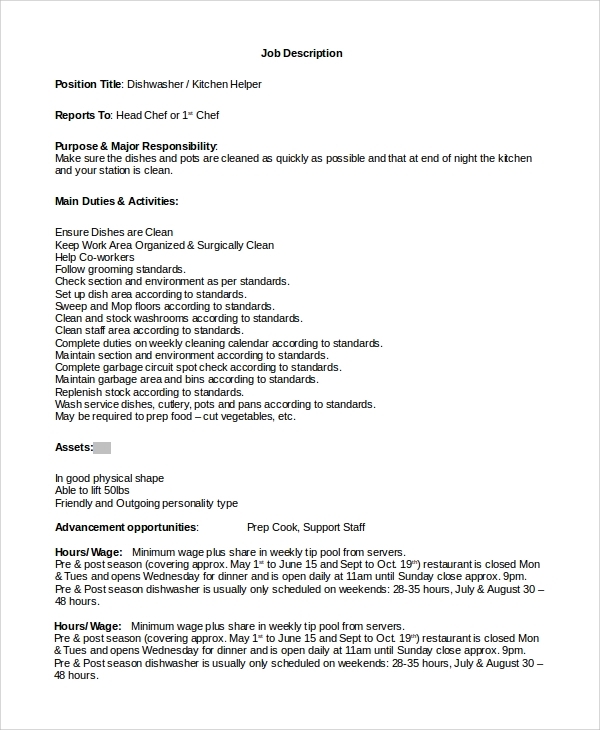 Then the job summary and responsibilities are listed up in the document. There are other duties and qualifications, mentioned under separate subheads. Why do You Need These Samples? The restaurant owners and private household individuals look out for competitive employees for taking care of the dishes and utensils. They need to have good sanitary sense, care and responsibility while handling the dishes. On the other hand, able candidates are always looking out for reputed restaurants to work in. The online portals bridge the gap between the two, bringing them closer. You can specify exactly what you want from the employees from these Job Description. While writing the job description, you can include certain principles of your business to highlight your hallmarks. It is a way of conveying your brand image too. The position title, duties and responsibilities of the employee are summed up under separate sections, along with bullet points. The other skills and clauses of the agreement are specified in the document. The name and logo of the restaurant are specified at the top of the template. 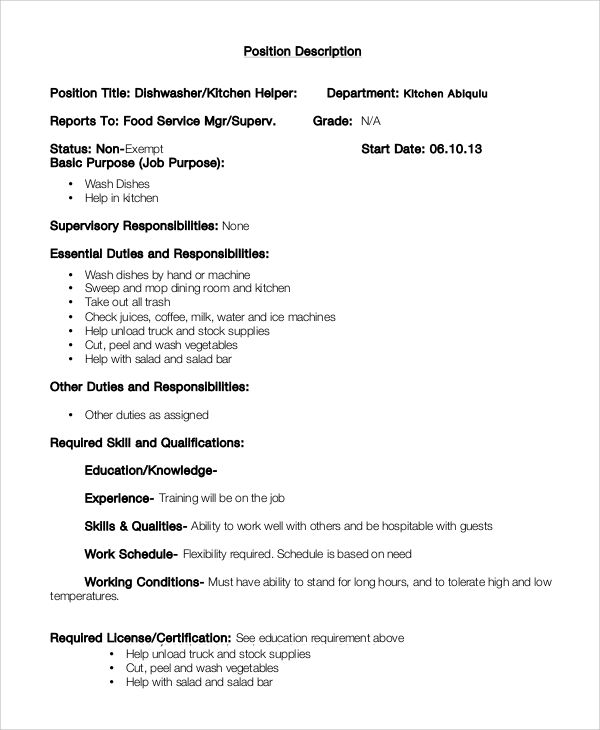 The person whom the employee has to report to and job positions are mentioned before providing with the details about qualifications, job responsibilities and uniform codes. What Should be Included in These Samples? 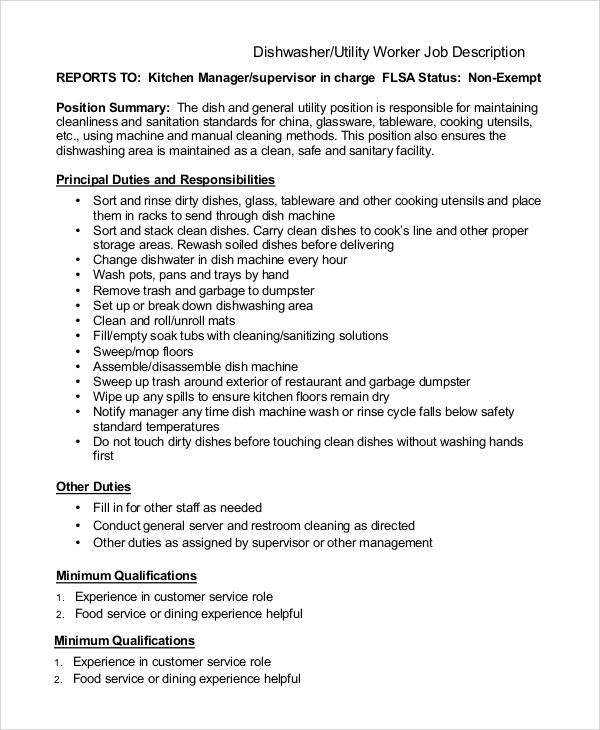 A typical Job Description Examples for dishwashers begin with the job position and the name of the restaurant. you can include a short description about the history of the restaurant. The duties and responsibilities to be shouldered by the employees are specified with clarity here. It saves the employers from repeating the same thing to every individual who appears for the interview. The uniform code also forms an important part of the template. There is a list of good sanitation habits in the templates. 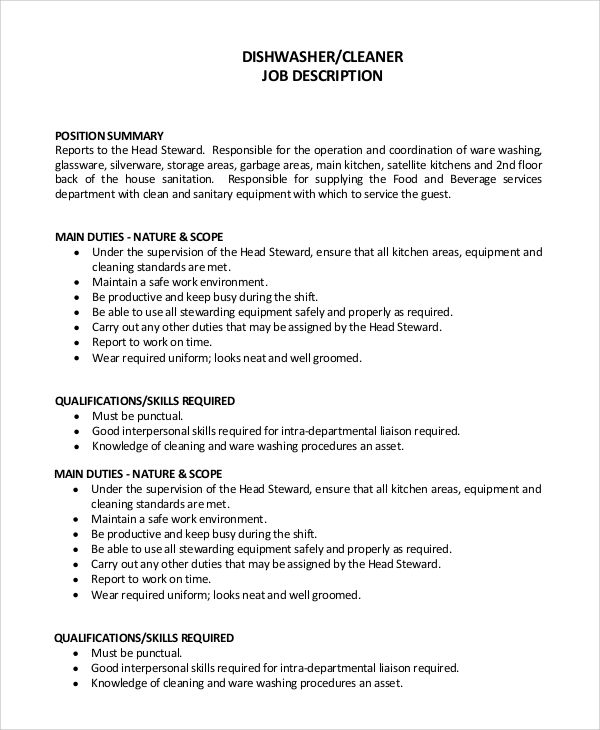 The template also contains the qualifications required by the employees. 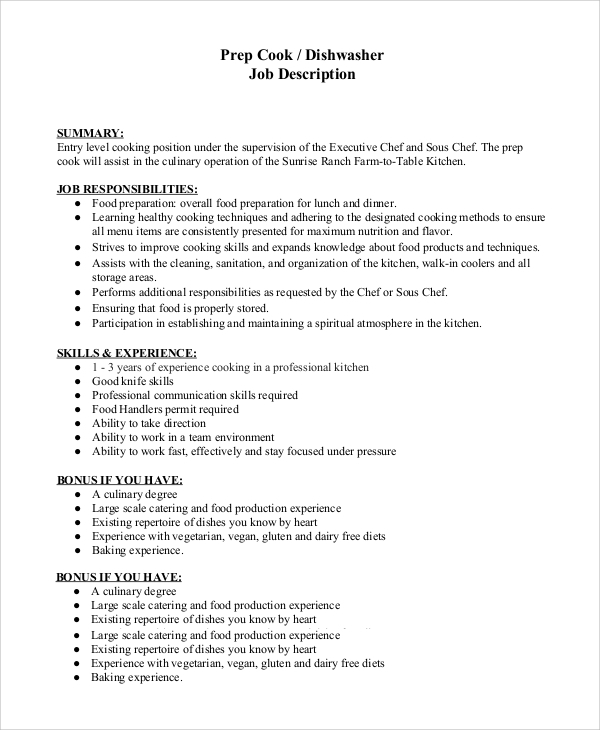 In a nutshell, the restaurant managers can convey the entire set of requirements through the templates. Restaurants vary a lot in profiles and so, the skill levels of the employees are also variable. You can browse through the website for different formats of templates. 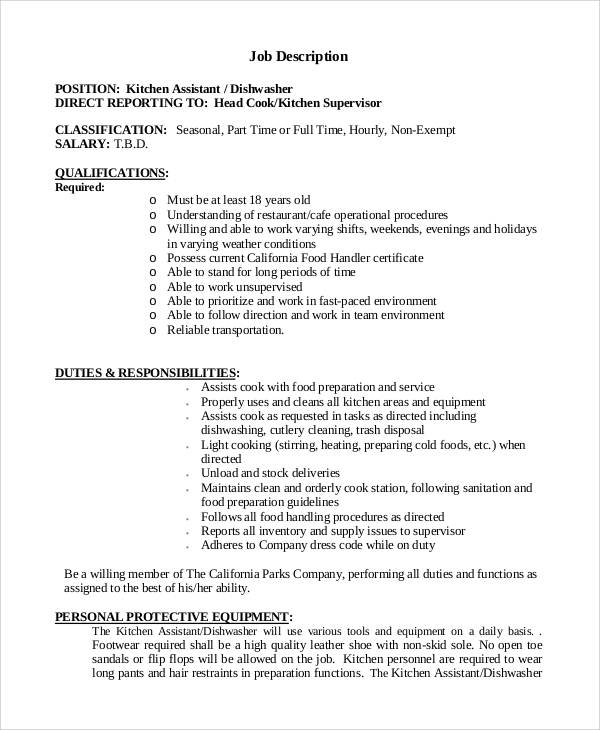 You might also want to look at Controller Job Description and Server Job Description Samples. All these are given in this website, ready to be customized.